[prMac.com] Peine, Germany - Independent developer, Lemke Software GmbH today is proud to announce the release and immediate availability of GraphicConverter 10.7, an important update to their popular image editing utility for macOS. The utility has become known as the "Swiss Army Knife" of image editing applications, and allows users to convert any of over 200 graphic file formats into any of almost 80 other graphic formats. GraphicConverter's 1.5 million users around the globe will appreciate the new features version 10.7 brings to the app. New features include a dehaze batch action, a new service to convert JPEG files to 75 or 85 percent, the ability to import exported LR keywords into the keyword palette, and much, much more. "GraphicConverter has long been one of the most popular image editing utilities available for the Mac," says Thorsten Lemke, founder of Lemke Software GmbH. "This new version builds on GraphicConverter's already great feature set, providing both new and improved features for our users." GraphicConverter has long been one of the most respected image utility tools available for the Mac. Apple was even impressed enough to have included GraphicConverter as a default app on many of their Mac models. While Lemke Software added several great new features to version 10.7, the improvements didn't stop there, as the new version also offers considerable improvements to the app's previous features. 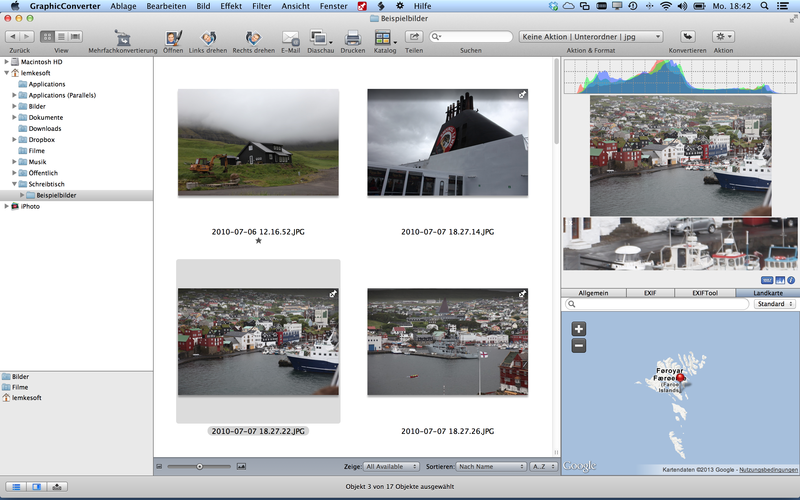 As always, GraphicConverter 10.7 is the best way available on the Mac to capture, import, convert, and export images. The app also offers power image editing and slideshow capabilities, and provides color management profiles, 3D image support and much more. "We've made GraphicConverter 10.7 easier to use than ever, thanks to the informative tutorial videos we've posted on out YouTube page," continues Thorsten. "Users who would like to try GraphicConverter to make sure it fits their needs can download a trial version and follow along with the video tutorials. Plus, version 10.7 is a totally free update to any version 10.x customers." GraphicConverter 10.7 provides the best way to capture, import, convert, and export images on the Mac. The utility's graphic conversion features alone are worth the price of the app. Users are encouraged to try GraphicConverter today. GraphicConverter 10.7 is only $39.95 USD (or an equivalent amount in other currencies) and is available worldwide through the Mac App Store in the Photography category. It can also be directly purchased online from the Lemkesoft website. GraphicConverter 10.7 is a free update for all customers of version 10.x. Upgrades from older versions of GraphicConverter are available for $25.95 USD. Based in Peine, Germany, Lemke Software GmbH is a developer and publisher of Macintosh software. Founded by Thorsten Lemke in 2002, the main focus and passion of Lemke Software is centered on the maintenance and further development of GraphicConverter. Lemke Software also develops individual solutions for special customer requirements. All Material and Software (C) Copyright 2019 Lemke Software GmbH. All Rights Reserved. Apple, the Apple logo, Macintosh Mac OS X, and macOS are registered trademarks of Apple Inc. in the U.S. and/or other countries. Other trademarks and registered trademarks may be the property of their respective owners.